Monarcas and Xolos both entered the match in decent form, although the home side were slight favourites to win. In the end, they did the job and won 3-0 to put them back in a playoff spot. Tijuana had a nightmare of a match tactically, with many issues particularly in the defence. The attack wasn’t clicking for them at any point in the match, while Monarcas who are usually a structured and defensively solid side enjoyed the game. The home side were missing Gabriel Achillier who has been one of their most important players so far this season. Having made 4 Liga MX team of the week appearances, it seemed his presence would have been missed against a strong Xolos frontline of Juan Iturbe and Gustavo Bou. In the end, they managed to keep a clean sheet and were quite comfortable throughout the match without him. Malcorra provides energy in midfield for this Xolos team. Most of the attack and creativity comes through him. As for Monarcas, the same applies to Diego Valdes who has been immense so far this season. He performs a similar role although more forward-thinking than Malcorra. He is arguably the most important player that they have due to the creativity he offers in a structured system. They lack depth without him or Ruidiaz for that matter, and as a result they seriously lack goals. The 5-3-2 used by Coudet had them playing a high line as they had intended to attack and go seek a result. Unfortunately, the game plan was quickly killed as a second yellow from Aguilera in the 16th minute left the visitors with 10 men. From there we saw a bit of a 4-3-2. The wing backs continued to push up leaving the backline with little cover. This was a gamble on Coudet’s part and unfortunately for him it backfired. As mentioned, they played an offside trap which also heavily backfired as the communication within the defence was poor. In the image below, you can see the defensive line standing higher up off the ball to try and cancel out Monarcas’ movement. In that same image, you can also see they aren’t all in line and this is because the offside trap was executed terribly. In the second image, you can see Aguirregaray trying to mark Diego Valdes. In the third image however, you can see Valdes ending up on his own while Aguirregaray stayed back. He took a step back in order to try and get the offside call but completely mistimed his footwork which gave the Chilean an open chance which he duly put away to make it 1-0. Of course the goal is the notable example, but there were many situations in which the offside trap was caught out, and more so after Xolos reverted to 4 at the back because of the red card. In this second example, you can see the offside trap yet again failing. Again the movements of the defensive line prove that the idea was to form an offside trap and try to catch the opposing attackers ahead of the line. When Sepulveda starts running to receive the long ball, Perez takes a step back like Aguirregaray but Valenzuela plays him onside due to standing out of line. Coudet had an intention to have Aguirregaray and Perez standing higher up, but the problem was that’s no way to play an offside trap as it can leave the 2 center backs totally exposed, and that’s exactly what happened as Monarcas took advantage. This was a tactical error on Coudet’s part. With 3 men, perhaps it would have worked as there would have been more cover but 2 men can’t work on their own. It wasn’t just that though, the communication was terrible as it seemed no one knew what they were doing. Donatti stood completely still until Sepulveda won himself the chance. All were at fault for these early chances, including the one that was converted. Monarcas offensively went out to expose that backline and 2 of their 3 goals came in that manner, although the second one was a foot offside but the same issue applied. The opposition tried to catch Rodolfo Vilchis offside and this time did it right but were left to rue a bad call from the referee. While not as bad as the defensive and tactical errors Xolos faced, that doesn’t mean Morelia was comfortable. Without Achillier, they began pressing a bit more and while for the most part they did alright, they did get caught out at times. To begin with, Xolos’ attack struggled to find themselves. Both ran at the defence at times to intimidate but found themselves with little support. This probably had to do with Aguirregaray and Perez not trying to push up too much in order to keep a bit of balance, something that backfired as discussed earlier. As usual, Malcorra ran the midfield and created most of the opportunities. He continuously drove forward and brought the team along with him with the pace he was playing at. While he was the best player on the night for the visitors, Monarcas did a good job of keeping him out. Juan Iturbe played as more of a false 9 and tried to support Bou as much as possible. The former dropped deeper while the latter pushed high up in search of a goal. Iturbe was the one to note however, as he was the magnet to the opposing defence. In an attempt to break down the home side, Iturbe was the player to drop deep and take advantage of the opposition’s closing down in order to create some space. 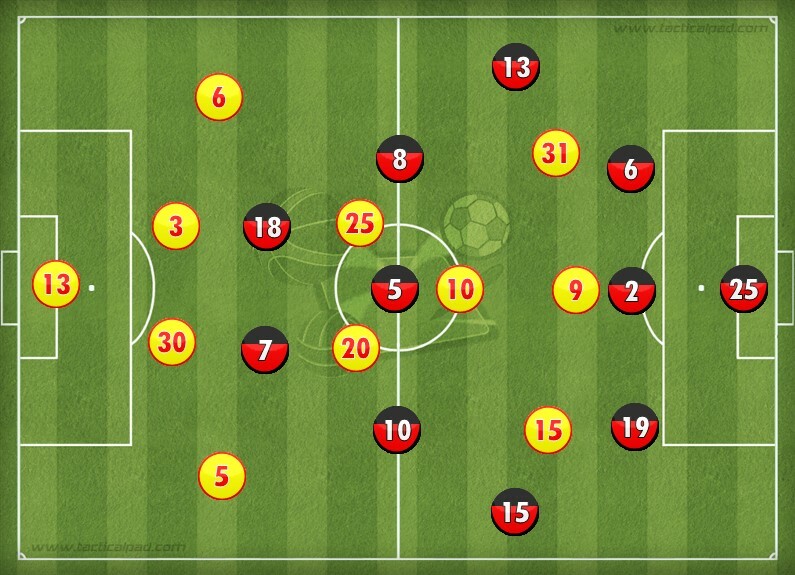 In the attack, Xolos formed a sort of 3-1-3-1. Joe Corona went back as cover in case of a counter attack, to form a backline consisting of him, Donatti and Valenzuela for safety measures. Musto stayed in the middle. Malcorra roams in between the attacking midfield and the middle and the 2 wing backs overlap and always join the attack. For this reason, Corona took the responsibility of covering and adding an extra man to be wary of the plan backfiring. The important part in all of this though was the idea to open up space from their pressing. Xolos were passing around patiently looking for the opposition to give an opening by mistiming a run or forcing them to disrupt their own shape. Juan Iturbe is the main man for this as he’s the one who draws the defenders as shown in image 1. You can see he’s dropping deeper than the position he was officially listed in as well Monarcas beginning to try force a misplaced pass from Xolos. In the second image, you can see he has drawn 2 players and one of them was actually defending Aguirregaray freeing him completely. The idea was to try and expose them by disrupting their shape as mentioned earlier and they were well aware of the plan, but it was poorly executed yet again. The 2 main reasons were because of poor communication and a lack of final ideas. In the 2nd image, you can clearly see Aguirragaray was completely open after Iturbe gathered his marker, but he went for the shot instead of making a through ball over to the right flank like he was supposed to. The 2 halves were very similar, as Monarcas continued to beat the offside trap and press and Xolos executed both their defensive and offensive plans poorly. While Coudet took a gamble in continuing to keep a high line after the red, in the end the players didn’t help the cause and neither can be solely blamed for the errors. Brian is a Peruvian and lives in his home city of Lima. He is naturally a big fan of anything Peruvian football, from the national team to the domestic league. Elsewhere he's a fan of Liga MX and A-League and one of his favourite hobbies is looking for the next hottest prospects in football, those under the radar particularly.